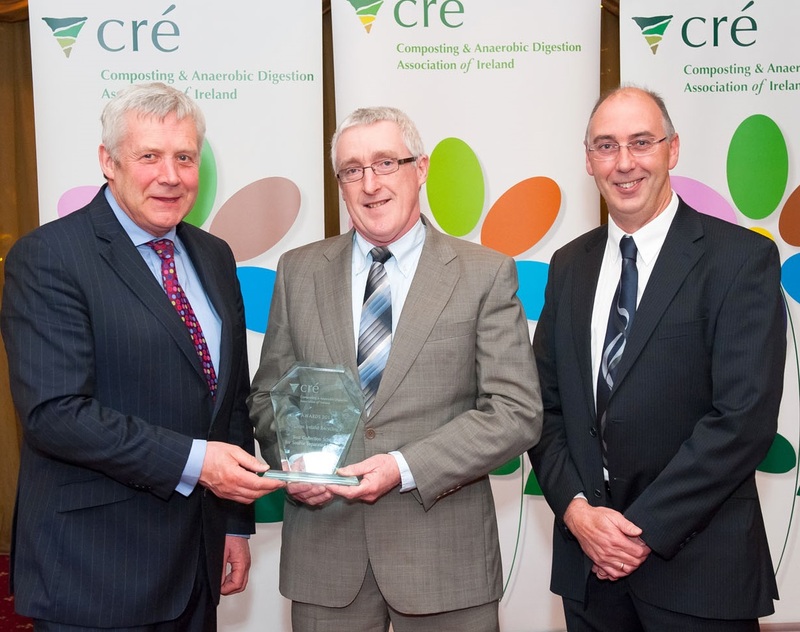 The Cré Awards 2013 celebrated the hard work, dedication and success of organisations within the composting and anaerobic digestion industry both in Ireland and Northern Ireland. 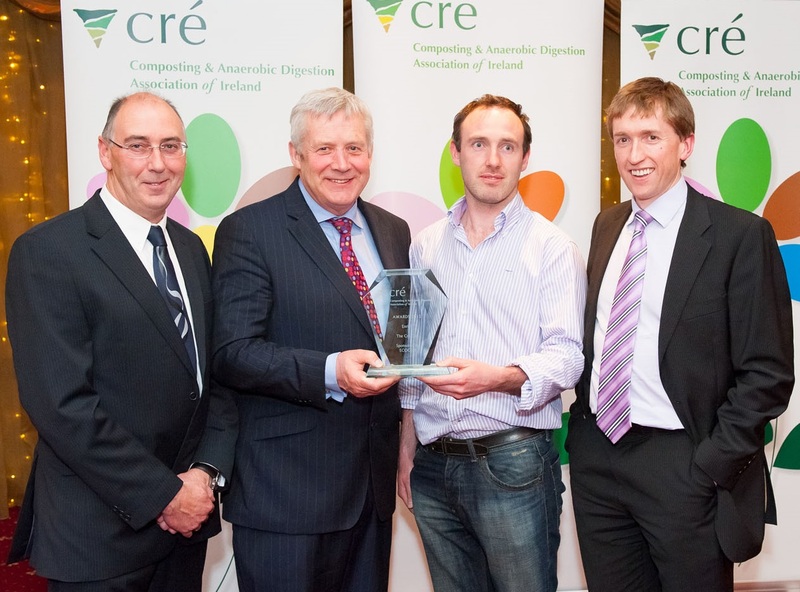 An Awards Ceremony sponsored by Ecocem and Edina was held on May 10th in Dublin. Fergus O’Dowd T.D. Minister of State at the Department of Communications, Energy & Natural Resources and Environment, Community & Local Government presented the awards. The event rose much needed funds for the Irish Cancer Society. 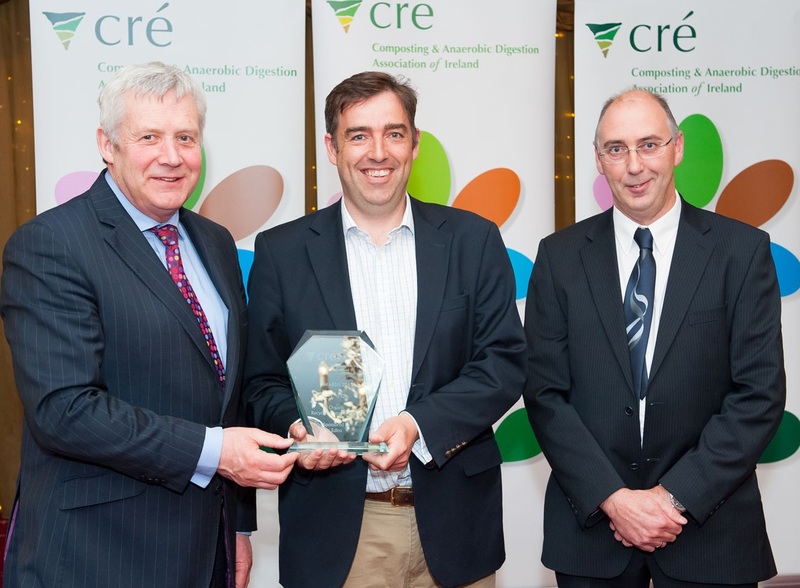 “Edina is very proud of our connection with Cré, and we are delighted to continue our support through sponsoring of the Industry Awards. We congratulate all award winners and commend them on their commitment to this Industry” said Colin McKibbin of Edina. 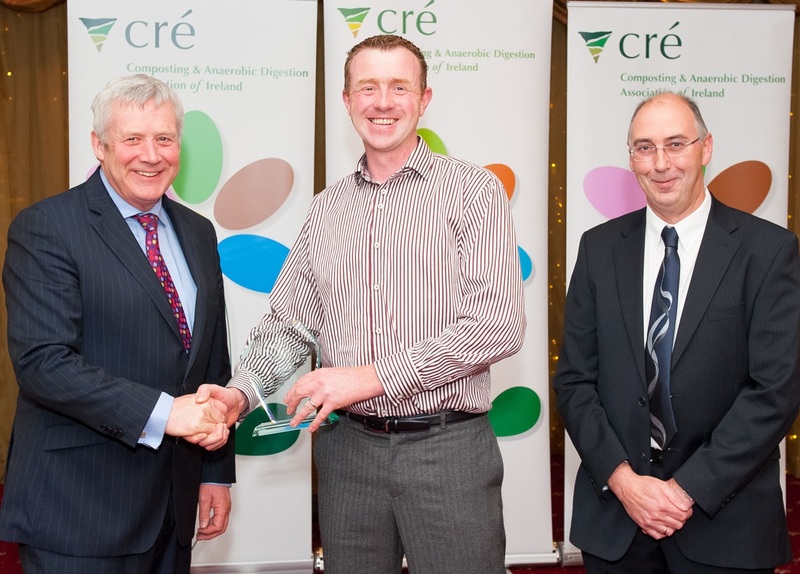 This award is for the best managed composting or biogas plant in Ireland. The main criteria for this award won by Enrich are -Evidence of excellence in site supervision, operational features, best management practices, teamwork, staff welfare, data management, local acceptability, methods or systems for environmental management, plant maintenance, marketing strategy for compost/digestate products and general impression. The biogas sector in Northern Ireland is developing rapidly with many plants being built on farms. Typically this technology had been imported from other countries and had evolved specific to these countries. William Industrial Service has demonstrated that the feedstock specific to Ireland, being primarily grass/silage based, required a fresh approach to biogas technology. William Industrial Service developed a technology that suits the feedstock in Ireland. Their technology is designed to be customer specific and suits the business environment in Ireland. The average pay back for AD plants is 7 years – with this new technology, a 500KW plant has a typical payback of 2.7 years. William Industrial Service’s first plant is now operational. There was a broad range of applications for this category, ranging from how research can benefit the sector to companies demonstrating the work they are doing in persuading the general public to accept and use the brown bin. Down2Earth Material’s range of compostable packaging combined with the work they undertook to educate the general public on how to use compostable products has assisted the consumer in having a better understanding of how food waste should be segregated and presented to our sector for further processing. 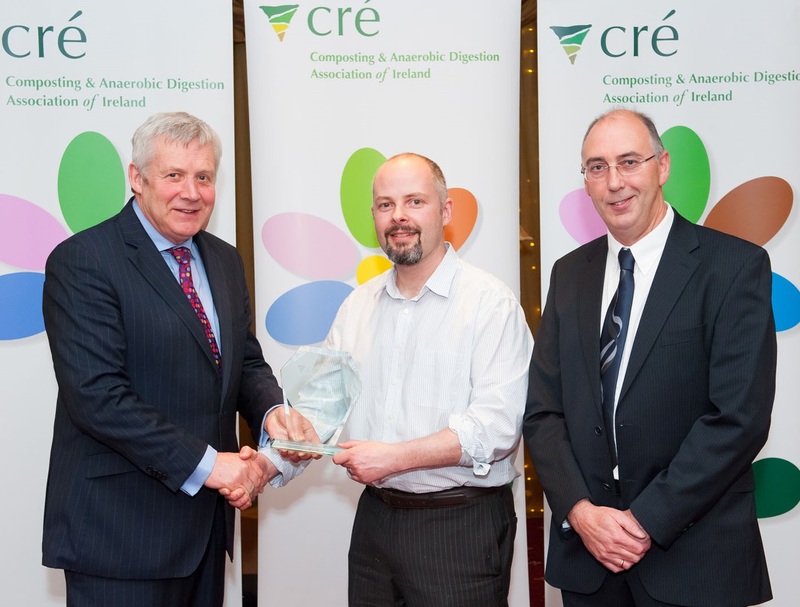 In recognition of a composting facility which has clearly shown itself as an example for the industry to follow, the winner of the 2013 Cre ‘Highly Commended’ Award is – Greenking Composting in Wicklow. One of the main criteria for this category was “to demonstrate a machinery or service solution which increased efficiencies at a compost/biogas plant while adding value to the outputs”. Nova Q, winner of this award supplies a microbial inoculant which is being used at several composting facilities in Ireland. It has been proven to enhance the composting process, provides more capacity in plants and has facilitated in enhancing both process and environmental controls. Contamination of the brown bin is a huge problem within our sector with contamination rates high. We are all aware of the challenge of getting households to use the brown bin and to present it properly. Entrants for this category had to demonstrate methods of promoting separate collection and highlight innovative ways to educate users and control contamination. Success was measured on participation and contamination rates. It must be said that this category attracted a number of excellent collection schemes. Clean Ireland Recycling, winner of this category has taken a European model for food waste only collections and has demonstrated that it can be done successfully in Ireland. An independent audit by their local authority demonstrated a 69% participation rate and contamination levels of only 1-2%. Clean Ireland Recycling Ltd uses a ‘pay by weight’ charging mechanism, creating transparency to the householder therefore demonstrating the financial savings that can be made by using the brown bin. 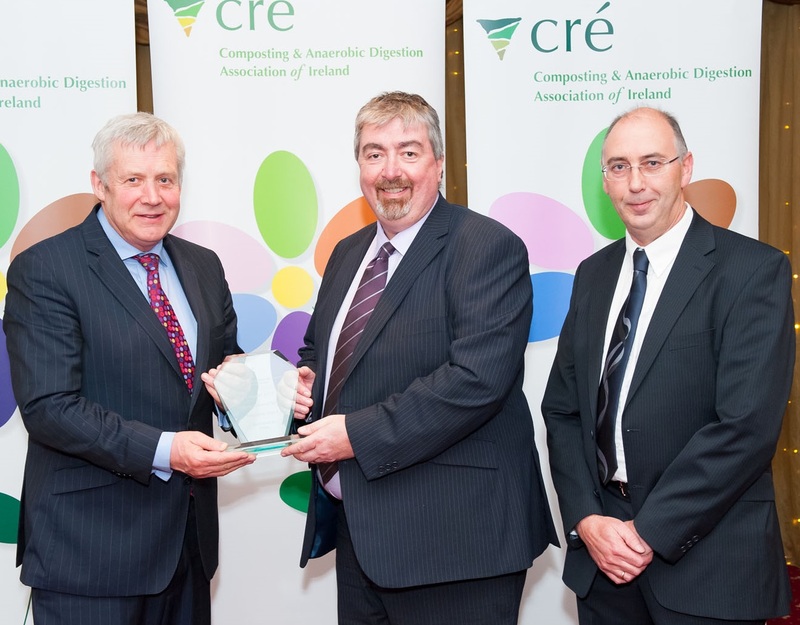 Cre hosted the inaugural Northern Ireland Anaerobic Digestion Trade Show and Conference – ‘AD NI’ on 3 October 2012 in the Hilton Hotel Templepatrick, Belfast. Since the Renewable Obligations Certificates were launched, there have been nearly 80-90 planning applications to build mostly on farm anaerobic digestion plants. Of these applications approximately 30 have received full planning permission. Cre and other organisations have hosted events to educate people on anaerobic digestion. At this stage, Cre wanted to take stock of developments since ROCs were launched to review, assess, debate issues and opportunities arising around the development of the anaerobic digestion industry. Recently there have been some real issues arising such as securing feedstocks and gaining finance. The event was attended by 120 people.